How to Cheat at Configuring ISA (Internet Security and Acceleration) Server 2004 meets the needs of system administrators for a concise, step-by-step guide to getting one of Microsoft's most complex server products up and running. While books twice its size may be perfect for network designers and security specialists, this is written for the person in the trenches actually running the network day to day. 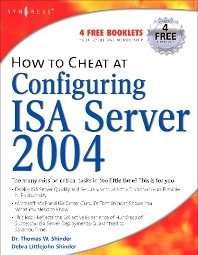 How to Cheat at Configuring ISA Server 2004 is written for the vast majority of Windows System Administrators with too much to do and too little time in which to do it. Unlike books twice its size, this is a concise, to-the-point guide.